For the most part, I have a pretty consistent schedule for running my home business. I get up and answer email and take care of a few social media tasks while my son gets ready for school. This fits well with making his lunch, getting him breakfast and overseeing his preparations to leave for the bus stop. It helps that he’s old enough to mostly get himself ready (as long as I keep him on task). After my son is off to school, I can get into the nitty-gritty of my home business schedule, writing and accomplishing other tasks. I even usually have time to exercise. In the afternoons I can take care of odds and ends before my son gets home from school and I help him with homework and take care of dinner. All of this changes sometimes, though. My summer schedule is usually a mess, and I never know when something unexpected will come up. On top of that, there are a number of projects and activities that I want to participate in that won’t yield immediate payment. Fitting it all in can be a challenge sometimes when I get overwhelmed with paid work. One of the things that has helped me get down to what’s most important with my home business schedule, though, is the idea of making sure that I do enough each day to keep the lights on. 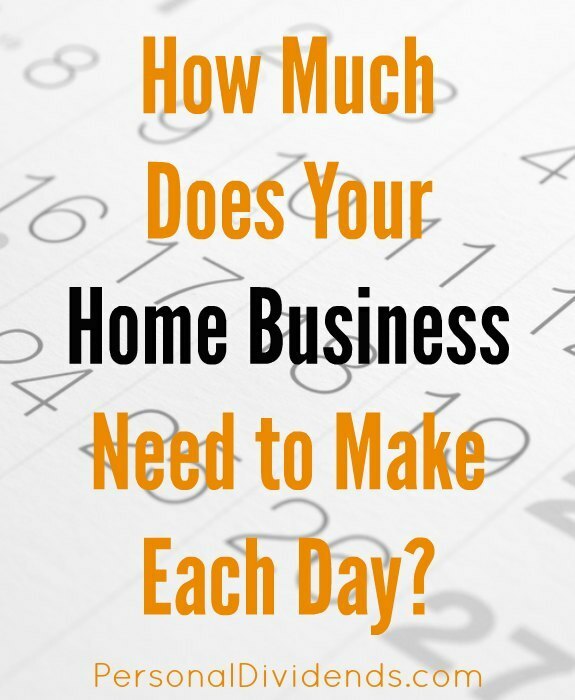 How Much Does Your Home Business Need to Make Each Day? This tweak to my home business schedule was prompted by Joe Saul-Sehy from Stacking Benjamins. While we were having a chat about business on the Money Tree Investing Podcast, he said that he figures out how much he needs to do to keep the lights on, and then goes from there. I sat down and figured out how much money I need to make each day in order to maintain my family’s lifestyle. Now, as long as I hit that number each day, I can move on to other projects. This has actually provided me with a lot less stress in my life. Part of the advantage comes from the fact that a home business schedule doesn’t have to be based on a traditional schedule. I purposely figured out how much I had to make each day, based on a five-day workweek. However, it doesn’t have to be that way all the time. I frequently do some work on Saturday and Sunday. This makes it easier to shift things around a little bit. If I know that something will mean that I’m $100 short one day, I can make it up easily on a different day. Another thing I find with my home business schedule is that there are days when I end up with large chunks of time to just work. On those days, I can sometimes do enough work for the next day as well, clearing an entire day for a pet project or some other activity. This is a great way to boost my productivity as well as ensure that I am making enough money for my family to live on. One of the hardest lessons to learn as a home business owner is that you need to stop working at times. It’s true that there is always something you could be doing for your business. However, you need to make time for other things in your life. You need to take time for family, friends, relaxation, and hobbies. If you want to expand your business, you also need time to work on things that may not yield immediate fruit, but could be profitable down the road. All of this means that you need to make sure that you stop working just for the money. When you’ve hit your number for the day, it’s time to move on to something else. This is a good way to keep your home business schedule from taking over your life. Life without balance means that you let other things slide, so it’s a good idea to take stock of where you stand each day, and once you know you’ve made what you need to, move on to something else.